Harissa is a hot chilli pepper paste that originates from Tunisia and is made up of roasted red chilli peppers and some herbs and garlic. 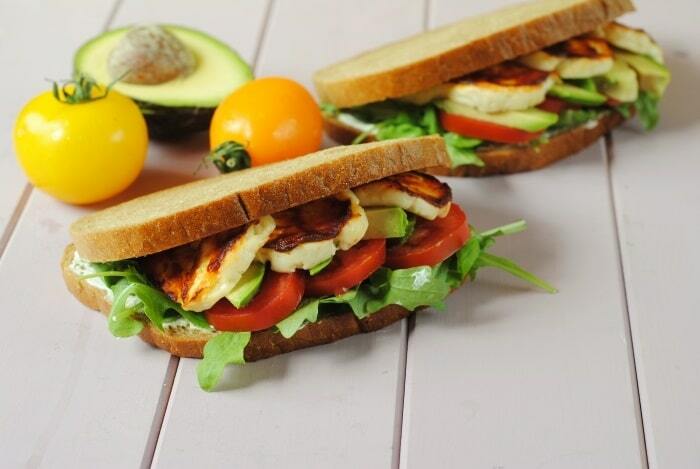 It pairs perfectly with the saltiness of halloumi to make a Halloumi Sandwich like no other. Let’s talk about sandwiches! They get such a bad reputation as being a bland and soggy lunchtime option that is always unhealthy. 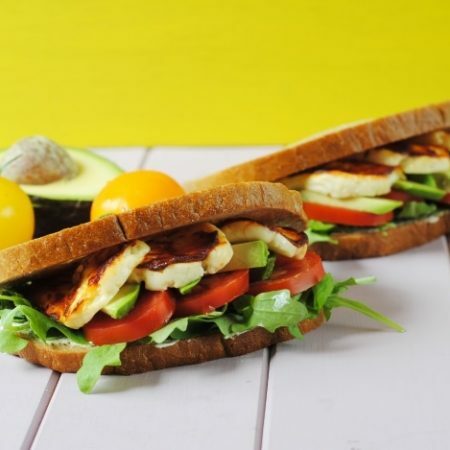 If you are just buying one at a supermarket, then that might be the case, but spend a few minutes making your own and you will be winning at lunch time. I have definitely been winning at lunch time recently and that is because sandwiches have made a comeback in my life. One of my big pregnancy cravings has been bread and while I could easily munch my way through a whole loaf in one sitting without even bating an eyelid, I am trying to be restrained and keeping it to one sandwich a day. Being 95% meat free, you would think that my sandwich options are limited, but I am really enjoying the challenge of creating delicious, and out of the box, vegetarian sandwiches. 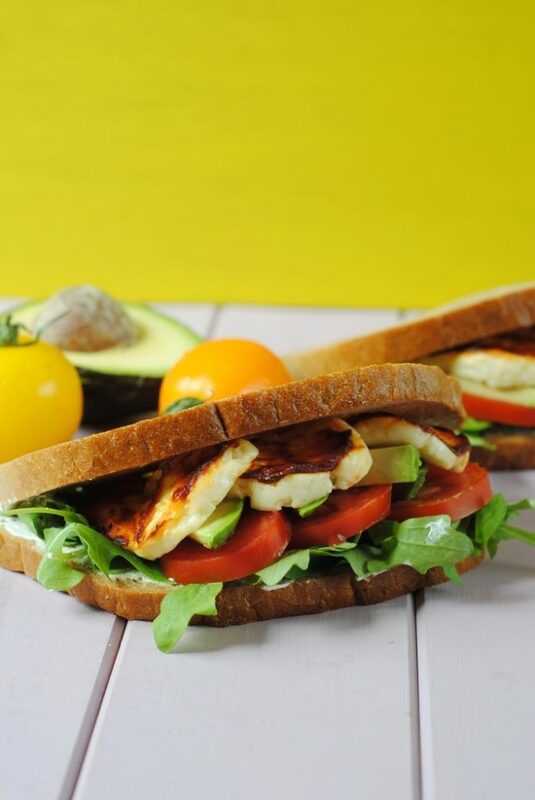 Halloumi is always going to be a favourite with a lot of vegetarians, because it has a texture like nothing else and you get that bite that you wouldn’t get with just vegetables. Instead of just going with plain halloumi, I spread some homemade harissa on it (recipe for that coming soon) and it made me wonder why I hadn’t been eating halloumi like this my whole life. If you think that I would just be satisfied with the spiciness from the harissa, then you would be wrong. Also, do you know me at all?! I wanted an extra bit of heat, as well as some more texture, so I added in a few of my favourite Peppadew Hot Piquante Peppers. I have to admit, I ate half the jar just picking at them before they even made it in to the sandwich – I love them that much, but a few did make it under those juice tomatoes. Don’t just eat these Peppadew hot peppers out of the jar though. I mean, do, but there is so much more that you can do with them. They have so much flavour and texture, for so few calories, that they are the perfect way to give a bit more “oomph” to a sandwich. The other advantage of a sandwich is that not much effort needs to be put in to making them and that is fine with me at the moment as I am working hard to get everything done because we are off to Edinburgh on Thursday to celebrate by birthday! I have never been to Scotland before (I know, I live in the country that boarders it), so I am so excited! I am very lucky to have travelled a lot around the world, but I haven’t seen enough of the world very close to me. So, expect some Scottish recipe inspiration when I get home. Spread the harissa over the halloumi slices and put them under a medium grill for 10 minutes, until cooked and a little crispy. Spread the Greek yoghurt on the slices of bread and top with rocket, Peppadew piquante peppers, tomato and avocado. 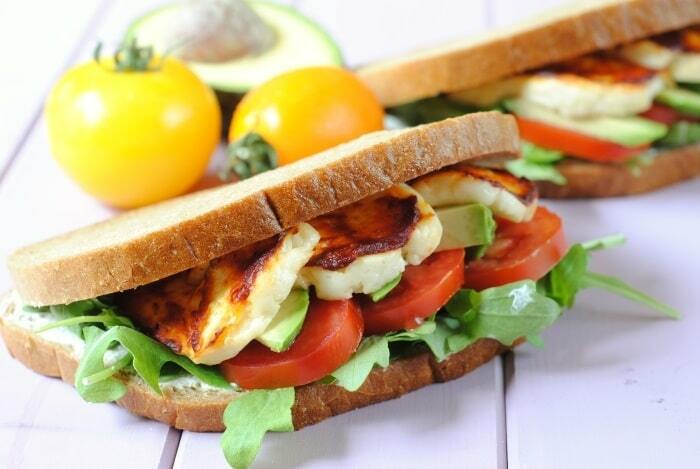 Top with the cooked halloumi and add the other slice of bread on top. 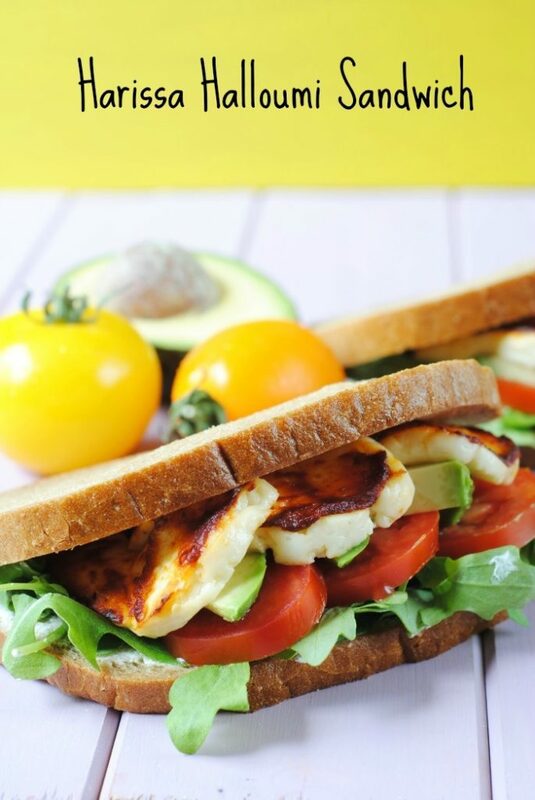 While I personally can’t eat the bread or do the spicy things, I know my spicy-food sandwich-loving guys are going to love this for lunch 😉 Especially with the avocado, they’d put avo on everything if they could. This looks yummy. We have sandwiches most weekends, so this is a new one for us to try. If you have any sandwich ideas suitable for kids (not spicy), I would love to see those. My kids have a packed lunch ever day and I have run out of ideas. 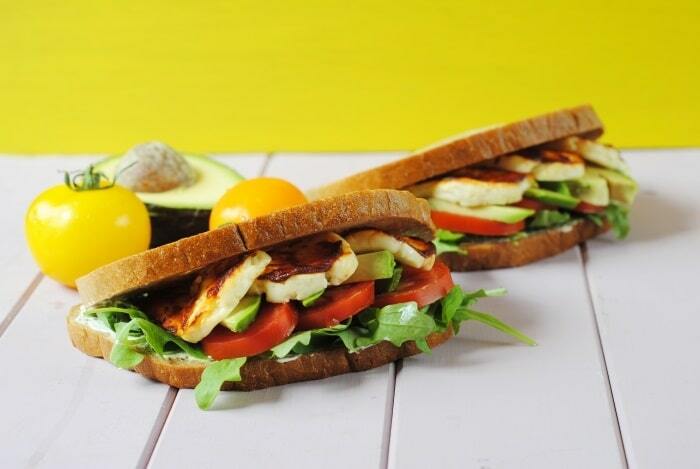 This literally looks like the perfect sandwich, in fact I am pinning it so I can make my own because I adore harissa! I love using new spices in a dish and get surprised how tasty it could be. 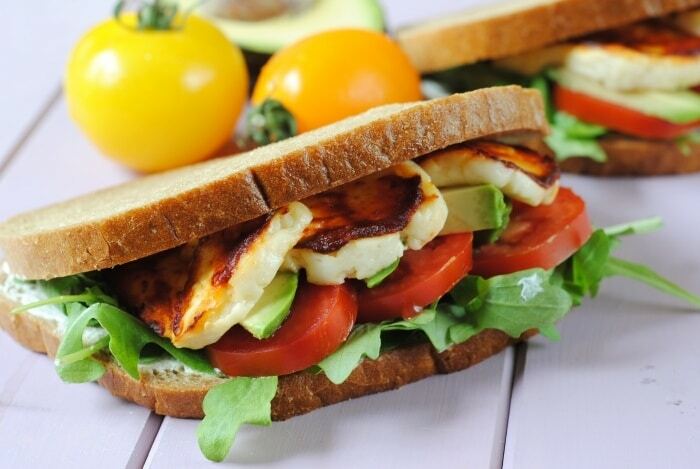 I love this sandwich and definitely have to make a try. I love that more vegan/vegetarian sandwiches are available commercially now – but you’re right, making your own adds something. The harissa in this really appeals!